Princeton Satellite Systems has developed an integrated solar powered electric car charging station for off-the-grid electric car charging. The common "wouldn't it be cool" idea with electric cars is to use solar or wind power. It's not practical to directly power an electric car from solar or wind power, because for example there isn't enough surface area on a typical car for solar panels to make anything more than a pittance of power. What will work is to integrate stationary renewable electricity systems with an electric car charging station. Princeton Satellite Systems announced on Friday an electric car charging station integrated with a stationary solar power system. The company claims the SunStation is the first 100% green charging station for electric vehicles, because all power comes from the Sun. The SunStation has a built-in battery pack that enables recharging electric cars 24 hours a day, even when the Sun has set. It provides a 240 volt charging voltage for charging an electric car at it's normal rate, namely the Nissan Leaf in 8 hours, a Chevy Volt in 4 and a Toyota Prius Plugin Hybrid in 1.5. The system is installed simply by pouring a concrete base and bolting the station to the base. The SunStation does not require a wired connection to the electricity grid, because of the battery pack. Other electric vehicle charging stations require an electricity grid connection to provide the power. It does wirelessly connect via the cell phone network for a payment system, and allowing Princeton Satellite Systems to remotely manage the station. The concept is relatively simple, but is not available as a packaged product. Usually charging stations are connected to the grid, making the charging of an electric car directly impose a load on the grid. For a level 2 charging station the load is not very much, because the current electric cars take either 3.3 kilowatts or 6.6 kilowatts. 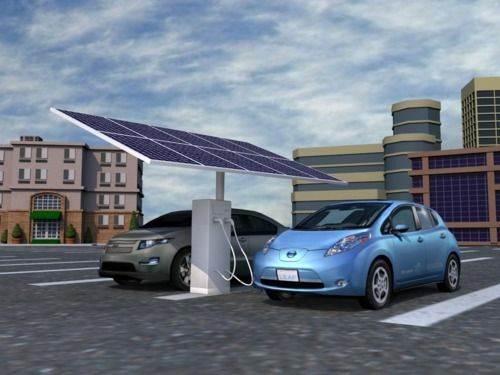 Because the SunStation has a battery pack for energy storage, the energy to recharge a car is provided from the battery pack rather than from the grid. While the SunStation does not require a grid connection, it is feasible to implement a similar system that is grid connected. Rather than recharging the local energy storage unit from solar power, it could be recharged from the grid. Such a system would still provide a benefit to the grid, by shielding the grid from demand spikes while charging an electric car. Tesla Motors' Elon Musk has hinted that the company's SuperCharger network will be integrated with solar power. In his case this would not be an idle boast, because he is also the Chairman of Solar City.